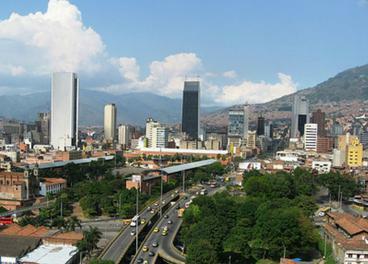 Over the last 21 years, the city of Medellin has worked vigorously to shed its violent reputation by aggressively focusing on urban development and social programs, inspiring several bold and innovative contributions in urban planning, public transportation and public spaces throughout the city's poorest neighborhoods. The walking tour starts with a ride on the metro to the San Javier metro cable cars before hiking up the steep hillside to the electric escalators taking guests to the top of Comuna 13 where you have the opportunity to take some memorable panoramic photos of the city. The heart of the city is located in the center of Medellin. It is the busiest district with over 1,000,000 daily pedestrians walking through the crowded streets each day. The walking tour will expose travelers to the diversity of ‘el centro' which is on exhibit from one street corner to the next; its rich in history, culture, exposing the grotesque, beauty, chaos, wealth, poverty, homeless beggars, street vendors, religious activists and young street hustlers trying to take advantage of anyone who drops their guard forgetting that they are in ‘el centro’ de Medellin. 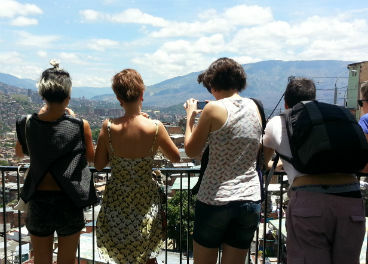 The tour in Medellin's La Sierra barrio provides travelers with a unique and honest understanding of the violent and troubled history of Communa 8. It demonstrates the social problems many of the cities poorest barrios have been plagued with over the past twenty-five years, at the same time being very informative about the cultural, social and economic transformation that Medellin has undergone with the help of many private and public investments, particularly in public transportation throughout the city. This is the most popular travel destination for local residents especially on weekends. 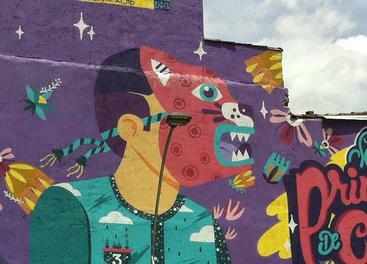 The vibrant buildings in the town are all covered with various styles of art known as ‘zócalos’. On weekends, you will find the crowded square with locals welcoming Colombian families, tourists and backpackers looking to get out of the city. One of the most popular attractions is the famous 70 million year old rock of “El Peñón.” It’s only 659 steps to the top, scaling the rock is exhausting but the views of the surrounding lakes, lush green hills and mountains from the top are spectacular. 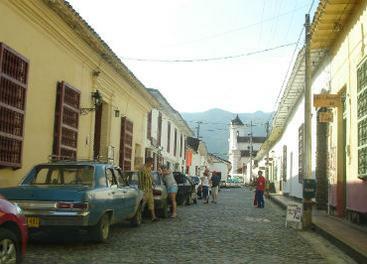 The town of Santa Fé de Antioquia was the original capital of the state of Antioquia, founded in 1541. It is affectingly described as ‘Cudiad de Madre’ by locals residents who declare this town as the birthplace of the paisa’s reputation of being warm, kind and full of life. 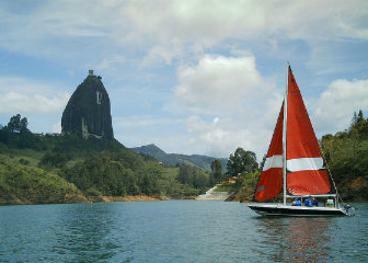 This charming town is full of cobblestone streets, well-preserved colonial homes, historical cathedrals and museums. Its architectural beauty can only be compared with that of its people and its history. The friendly locals are always happy to welcome foreign travelers into their small town. 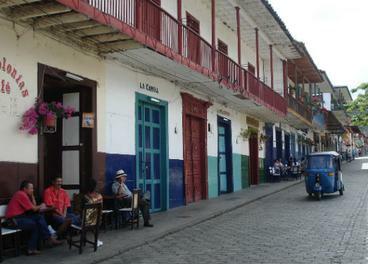 The town of Jardin is considered to be the most beautiful pueblo in Colombia. A part of Colombia's history virtually unchanged for over a century, preserved for generations. The center plaza is a popular area for locals to socialize, gossip and share personal stories with one another. The prominent architectural style of whitewashed colonial buildings, brightly painted doors, open balconies set against the backdrop of lush green hills can be seen throughout this charming pueblo. The town has not seen too many foreign travelers giving visitors a more authentic experience. Pablo Escobar was born the son of a peasant farmer and a school teacher. His criminal life began as a teenage car thief in the streets of Medellín, but he would one day become one of the richest men in the world. "I was born poor, but I am not going to die poor," declared a young Escobar. In 1989, Forbes Magazine listed him as the 7th richest men in the world, worth $25 billion dollars. In a display of wealth, Escobar purchased Hacienda Napoles, a 5,500-acre resort for $63 million dollars to host lavish parties for friends and family. The estate is now a popular museum and family theme park. Colectivo SiClas is a non-for-profit organization which was foundeded to promote cycling as an alternative form of transportation in the city. They are passionate about encouraging local residents to take up cycling as a recreational form of activity for the whole family. It's a social movement that provides late night bike tours through various communities in Medellin. The tour route changes every Wednesday with the intention of introducing the cycling culture to residents throughout the city. 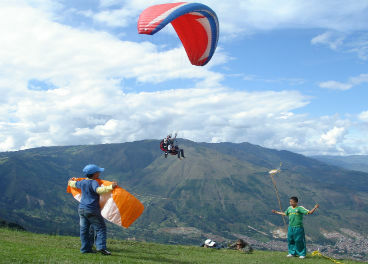 A great opportunity to explore Medellin while participating in a positive and healthy activity. Join us on the daily coffee tour in Medellin and discover the history of this magical bean and taste some of the best coffee in Colombia. 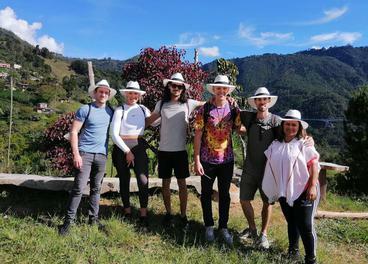 The Urban Coffee Tour in Medellin was developed for travelers with a limited time in Colombia who are interested to learn more about Colombian coffee without having to take a 2 hour bus ride out of the city to visit a coffee farm. Whether you have never danced salsa before or simply need to improve your dance skills, your own private salsa dance instructor in Medellin will teach you how to be comfortable, composed and confident on the dance floor. We introduce students to the language, technique and basic concepts of this popular dance. The private salsa instructions are custom-tailored to meet student’s specific goals. Our private dance lessons can be scheduled for anytime. You’ll be ready to impress your Colombian friends with your dance skills after your first private lesson. WHAT TO DO IN MEDELLIN, COLOMBIA? Copyright © July 2007-2014 Medellin Travel Group All Rights Reserved. Angeles de Medellin is a volunteer program, founded by Mark Kasemen, which was developed to help poor children and families in the rural village 'Regalo de Dios' one of the many neglected hillside communities throughout the city. The majority of the residents come from families who have been displaced by the country's civil war and the violent drug wars that have plagued Colombia for decades. The volunteer program offers children and adults who attend the center a safe environment to learn English, develop computers skills and interact with foreigners from around the globe. This tour gives travelers a great opportunity to explore the diversity of city in a short period of time were they will discover the transformation of Medellin, Colombia. The tour takes travelers on "the Golden mile" which is located in the most affluent district of the city including the popular restaurant and night life district "Parque Lleras." Other popular destinations included in the tour is Plaza Botero, Iglesia Metropolitiana, Cerro Nutibara, Parque de Las Luces, Centro Adminstrivo la Alpujarra and a ride on one of the popular metro cable cars with spectacular panoramic views of the city.